As we enter a new year the halls of our school are once again filled with the warmth of familiar faces. Students, faculty, and staff have reunited in this special place, and Morrissey Boulevard is alight with excitement. We will miss our recent graduates in the Class of 2018, and we wish them all the best as they embark on a new journey at colleges and universities across the country. From just a few miles away at Boston College and Harvard, to thousands of miles away at Stanford and even NYU Shanghai – our Eagles have soared far and wide. In their four years at BC High, these young men learned to pursue the magis, learned to tirelessly strive for that which lights them on fire. This past year their journey culminated in remarkable moments on Kairos retreats, two National Merit Scholarship winners, four state championships, and an ambitious production of Les Misérables. They leave us with the grace of God and the deep love of this community. With every ending comes a new and blessed beginning. I was struck by the optimism in the eyes of the Class of 2022, our newest Eagles, as they processed into Convocation and gathered together for the very first time. I reflected upon the Class of 2018, their journey and the promise we made them – the same promise we make to all our boys. BC High is where boys learn to become men for others. We shape young men into leaders of competence, conscience, and compassion equipped with the knowledge and passion to effect real change in this world. Staring into the sea of faces that represent the future of our school I was reminded of a quote from our all-school read, Fr. Greg Boyle SJ’s Barking to the Choir: “Begin with a title and work backward.” I ask our entire community to frame their reflection through this lens, but especially our freshmen. What is the title of your upcoming year? 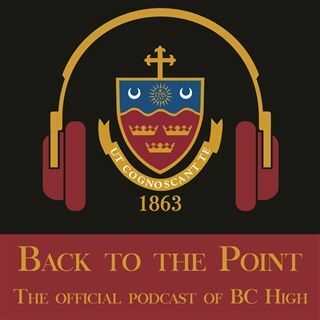 What is the title of your BC High experience as a whole? What’s your goal, and how can you work backward to achieve it? Our students will learn, as all our 15,000 living alumni have, that whether the goal is learning a new language, getting a role in the spring musical, or making the roster of a fall sport – they are not alone. The young men beside them, our faculty and staff members, and their family will be constant companions in any endeavor. We come from different families, towns, and backgrounds – but at BC High we are one team. Our goal as a school this year is to undergo a process known as “Sponsorship Review”. Every five years the Society of Jesus asks us to undergo a Mission Examen entailing a year of self-study and reflection. Through this review, the Jesuits ask us to articulate the fidelity of our promise to our families and students. We are asked to state the case for our mission and Ignatian identity. It is a powerful opportunity for collaboration and interaction between our departments, our students and their parents, and our alumni. God is indeed good! All the time. And we are here, together, for a reason.